Schools are required to provide for the spiritual, moral, social and cultural (SMSC) development of their pupils. Part of this requirement means that they actively promote the fundamental British Values. Promoting these British Values is now a central part of teaching and learning. By dong this, schools aim to help children become well-rounded members of the society. These British Valies are promoted throughout the curriculum,across the whole school. There are also seen in school ethos and policies, assemblies, special events and cultural celebrations. Below are some examples of how each of the British Values may be promoted in schools. Encouraging children to know their views count and their opinions are important—for example, following the children’s interests for topics and activities. Encouraging children to make decisions together e.g. when sharing a group toy, like a large train set. Encouraging children to see their role in the ‘bigger picture’, e.g. linking to part of a family, class , group, school, community etc. 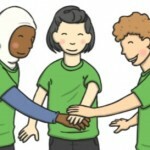 Encouraging adults and children to work together to create group rules. Discussing the need for rules and how they should be administered fairly, e.g. the need for rules to keep everyone safe and happy. Teaching children to understand their won and others; behavior and feeling and consequences. Working together to create and environment where actions are consistently followed through, e.g. adherence to class rules, follow ups on discussions and other choices explored after taking a group vote. Encouraging and supporting children to learn how to distinguish right from wrong. Providing opportunities for children to develop their self-esteem and confidence in their own abilities e.g. by sharing achievements and successes and promoting independence. Encouraging children to try a range of different activities and opportunities and to discuss and select their own preferences. Providing activities for all children to engage in and actively challenge gender-specific tasks and activities. Working as a group to create an environment that includes, values and promotes different faiths, cultures, views and races. Providing opportunities for the children to make links with the wider community, for example outings to local places. Encouraging children o learn about other faiths, cultures, traditions, families, communities and ways of life. Encouraging children to learn about the world around them—both locally and further afield. Please find below a downloadable document containing the information given above.